The Donald E. and the Delia B. Baxter Buildings provide 44,902 sq. ft. state-of-the-art research facilities to the Division of Cardiovascular Medicine. These buildings contain the Transgenic Mouse Core facility, the Proteomic Core, and the Institute for Cellular Therapeutics. In addition our large animal vivarium of 19,000 sq. 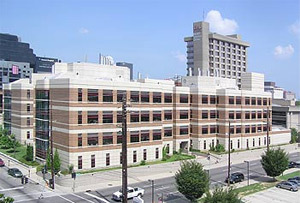 ft. is located in the Delia B. Baxter Building. The vivarium is designed to house up to 35,000 mice in both conventional and limited-access sterile barrier conditions (in this facility, “conventional” housing includes individually-ventilated cage rack systems and microisolator techniques). The MDR building supports 4,320 sq ft. of research space where small and large animal pre-clinical studies are conducted. 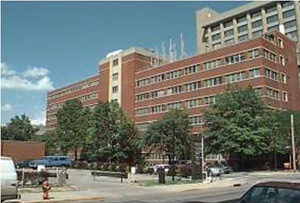 Primarily, cardiac catheterizations and surgery are performed in the MDR building. We have five rooms for training, monitoring of conscious animals and for experiments, a lab for Langendorff preparations, a room for echocardiography and hemodynamic studies, and a room for the radioactive work and storage. Using advanced surgical techniques, cardiovascular biologic and physiologic studies are performed in experimental models of cardiovascular disease, namely, myocardial ischemia and myocardial regeneration using stem cell therapies. In addition, the Research Resources Center, which is located on the floor below the laboratory, is a state-of-the-art AAALAC-approved facility containing two fully-equipped, recently-built operating rooms (219 square feet each) dedicated exclusively to sterile surgery, two scrub rooms (48 square feet each), prep rooms, and recovery rooms.